Jehan Aloysius and his grand thespians took to the stage recently to perform their version of Pyramus And Thisbe. The evening was full of hilarity and surprises as the actors even got some people from the audience to take part in the drama. The choreography gets the prize for being innovative and original. The Original version of Pyramus and Thisbe is told by Ovid in his Metamorphoses. There have been many adaptations of Pyramus and Thisbe over the centuries. Pyramus and Thisbe are two characters of Roman mythology, whose love story of ill-fated lovers is also a sentimental romance. So states an entry in Wikipedia. The Pyramus and Thisbe plot appears twice in Shakespeare’s works, most famously in the plot of Romeo and Juliet. Another version being the comic recapitulation of Pyramus and Thisbe which appears in the play a Midsummer Night’s Dream. It was this comic recapitulation that theatrical genius Jehan Aloysius staged. Aloysius led from the front playing the role of Nick Bottom. He was well supported by a group of immensely talented actors and dancers both girls and boys. The young girls’ bodies glistened in the stage lights and the dance was full of power and passion. It was an unforgettable evening with a lot of improvisation. 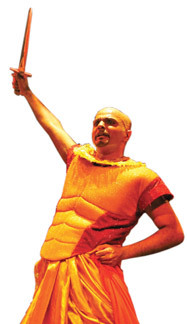 Aloysius and his crew drew peels of laughter with the usage of smart Sinhalese. A foreign lady in the audience was humorously called: “Anna Suddhiyek”.